My first boxer, Harley insisted I get my start in Therapy Dogs. She needed a job to do and loving people was right up her alley. She was a therapy dog for 4 years. My next dog, Noah who was also my constant companion filled the role of therapy dog with me for 12 years. I now have 2 therapy dogs, Ferran and Maura, that both enjoy bringing smiles to those they visit. As long as I can remember training dogs has always been a part of my life. For the past 13 years I have been training dogs professionally. Bringing the gift of dog training and the ability to let that training bring joy to others is as much a blessing for me as the people we visit. My husband, Rocky and I own Sharock K-9 Academy together. I am grateful to be blessed with a great husband, wonderful, loving dogs and the ability to share those dogs with others who need a four legged friend, even if it is just for a visit. I retired from the Houston Police Department/Homicide Division after 31 years of service and have always felt called to public service. 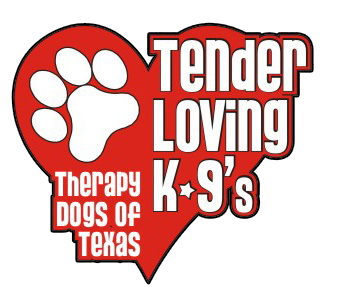 Since my retirement in 2005, I have been committed to Tender Loving K-9's and expanding this program in our area. One of our eight grandchildren is a special needs child and shortly after her birth, God placed the desire on my heart to do therapy dog work and I began researching programs and learned how the dogs enhance the lives of so many people while addressing their individual needs. Gracie is named after our granddaughter, Olivia Grace. 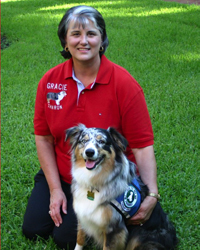 Gracie and I started the Therapy Dog Program at the Memorial Hermann Katy Hospital in 2007 and Memorial Hermann Memorial City Medical Center in 2013 and we are dedicated to weekly visits. Gracie and I are also a Crisis Response team with HOPE AACR. God has called me to serve and I am answering His call. My entire life I’ve been an animal lover. When I became the mother of two boys, I quickly discovered how much I also love young people and interacting with them. With a degree in public relations, I’ve had the pleasure of working with all sorts of people in different capacities. Before I rescued my first golden retriever, Luke, I was familiar with therapy dogs and knew I had to get involved. This would allow me to work with my dog and many people in the Katy community simultaneously. A perfect match! When Luke and I became a certified therapy team in 2008 we began working at nursing homes and at Memorial Hermann Katy Hospital. I had the opportunity to help launch the R.E.A.D. (Reading Education Assistance Dogs) program in our therapy group in 2009. I now have a second rescued golden named Eli who certainly enjoys volunteering. These two golden boys bring so much joy to my family and me. I hope we can continue to share that with others for a long time. 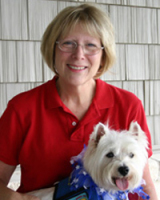 In 2007, due to a girl Westie who was personality plus and who, like me, loved interacting with people, I discovered therapy dog training and TLK-9’s. For years, I have known volunteerism was a calling from God. After teaching special education in Cypress-Fairbanks ISD and Garland ISD, I raised two daughters and actively volunteered in Katy ISD for over 12 years. In 2009, we began with nursing home visits and with R.E.A.D. in libraries. We then started serving at Memorial Hermann Katy in 2011 and at MH Memorial City in 2013. We did the R.E.A.D. program at ‘The Parish School’, which was very fulfilling given my special education background. Now we’re R.E.A.D.ing with children at McFee Elementary, and visit both hospitals weekly. Izzy and I are also a HOPE AACR team. This recent role of R.E.A.D. 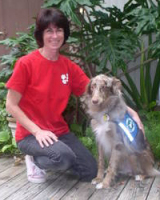 coordinator to the schools brings together my teaching background, my therapy dog work, and my calling to volunteer. I am excited and grateful to bring books and dogs together to help children grow in their confidence and capabilities as lifelong readers. I have spent most of my life in the company of children and dogs. After raising my own two children, I spent 12 years in a Spring Branch Middle School working with special needs children and then a private school working with pre-k kids. 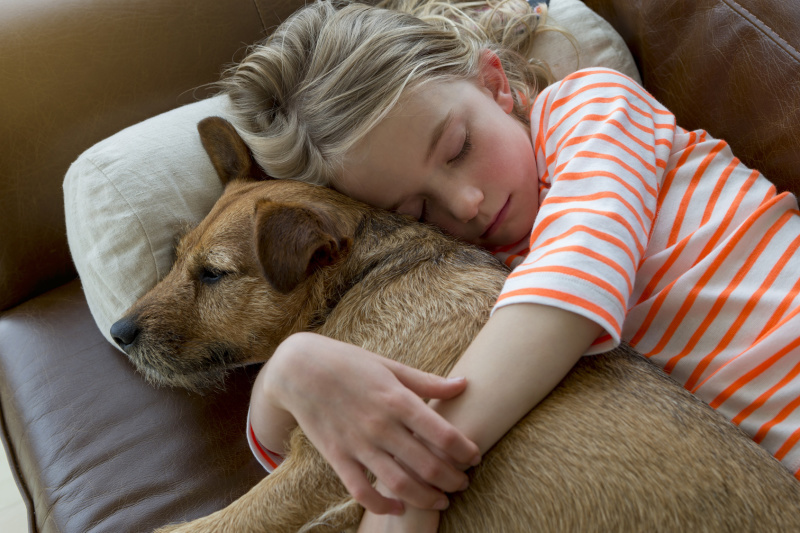 I always wished my love for dogs could somehow be included in my love for children. After the loss of my husband, I felt the need to share and give back some of the kindnesses that where bestowed upon us. At this same time, I had the opportunity to adopt a Cockapoo mix that I named Toby. Toby and I went to obedience training with Shannon and she suggested that we might be interested in therapy dog training. 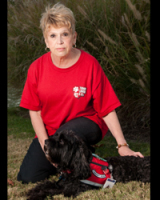 My new life journey began when Toby and I enrolled in a therapy dog training class along with Sharon and Gracie. I lost Toby in 2013 and now have my second therapy dog, Riley. Riley and I feel our therapy dog visits are a blessing to us and a gift to those in need that cross our paths each week. It is definitely a winning situation. Dogs are uniquely created to partner with us in many service areas. I became aware of pet therapy several years ago, but at the time did not own a dog with the necessary temperament or skills to be a therapy dog. Fostering dogs for Citizens for Animal Protection (CAP) for the past 12 years has given me the opportunity to observe lots of dog behavior and I even discussed the idea of pet therapy with several adopters of my foster babies. Eventually, I fostered Missy, an Australian Shepherd, and it was clear immediately that she had the sweet temperament necessary for therapy work. At about the same time, I met Sharon Evans at a CAP fundraiser and all of the pieces fell into place to become a therapy dog handler. 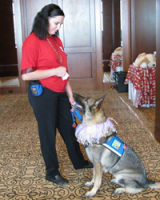 Missy and I joined Tender Loving K-9’s in 2007 and have participated in doing visits at Memorial Hermann Hospital and various nursing homes, but our favorite activity is reading with children. We became a R.E.A.D. team in 2009 and in 2011 I accepted the opportunity to be the R.E.A.D. Library Coordinator. I look forward to expanding our team of R.E.A.D.ers and introducing as many children as possible to the magic of books and dogs! 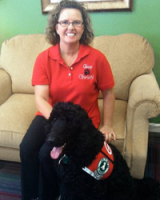 I love dogs and people, so therapy dog volunteering is perfect for me! I have a background in communications and always dreamed of the day that could fuse my love of people and my love of dogs. That dream came true in 2010 when I become the proud mom to Gus (an Australian Labradoodle). He has always had wonderful temperament and in the fall of 2012 we became a registered therapy dog team. We love meeting new people every week at Memorial Hermann Memorial City Medical Center Hospital and Memorial Hermann Katy Hospital along with other various therapy visits. 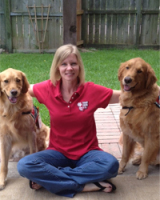 In 2013, Gus and I also became a certified crisis response team with HOPE AACR. There is nothing that warms my heart more than seeing someone smile when they see and touch Gus. He brings joy to my family and I hope we can continue to volunteer for many years.